The short-handled Gator was such a hit when it debuted, we decided to offer a version with a longer handle. 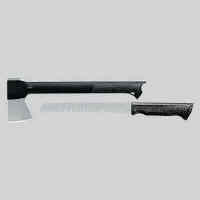 Dubbed the Gator II, this all-conditions axe makes a great addition to your basic camping gear. The longer handle results in greater striking force. And that force is kept safely under control because of our Gator texturing, which maximizes your grip.